In St. Peters Church on the upper east side of Manhattan, a group of nearly a hundred leading organizers and activists gathered to discuss the upcoming protests in support of Palestine. At the meeting activists reviewed strategy and tactics for building an effective protest movement against Israel’s crimes. Imani Henry, a leader of the International Action Center, says that the recent wave of protests against Israel is of historic proportions. The forum was called by the International Action Center, an organization founded by former US Attorney General Ramsey Clark, whose stated goal is “to work towards the liberation and freedom of all peoples living in the U.S. and around the world.” Chris Hedges, former Middle East Bureau Chief of the New York Times, also attended the meeting, putting forward a different perspective. 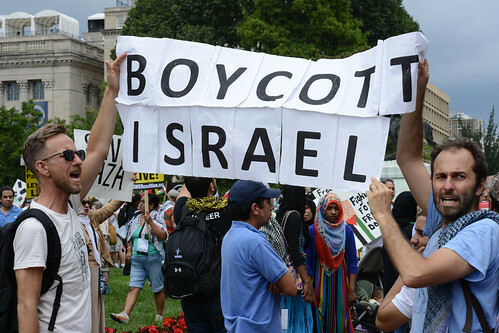 Hedges told PressTV that he felt economic boycotts should be the primary tactic. Hedges also highlighted the poor quality of US media’s coverage of the situation in Gaza. The organizers have set August 9th for the upcoming march to the United Nations headquarters. Palestine activists from all across the United States are expected to participate in the rally. Boycott, divest and sanction: The three tenants of the BDS movement protesting what many perceive as the Israeli occupation of Gaza. As the conflict with Hamas grows and civilians continue to be killed and displaced, some of are considering these tactics to pressure Israel into reversing its longstanding policies. Billionaire Georges Soros, trade unions, retailers and a select few governments have all stepped up their participation in the mass protest movement, as RT’s Ameera David explains. BDS Italy expresses its unequivocal and absolute condemnation of the shameful posters plastered around the city of Rome by the neo-fascist group Militia, as well as the general cooptation of the Palestinian cause ​​by the extreme right to spread anti-Semitism. BDS Italy denounces anti-Semitism as racist and reactionary ideology and condemns the use of Palestinian suffering as a pretext and tool for spreading this vile ideology. In particular, we condemn the fascist call to boycott Jewish-owned businesses, a call which includes an appalling “blacklist”. BDS Italy notes that the campaign for Boycott, Divestment and Sanctions (BDS) against Israel  is a strategy of nonviolent struggle, formulated by Palestinian civil society drawing inspiration from the anti-Apartheid movement in South Africa, to put pressure on a State responsible for violations of international law and human rights humans. It has nothing to do with the odious and despicable maneuvers of fascists new and old. BDS Italy also stresses that the global movement for Boycott, Divestment and Sanctions refuses all forms of racism, including Islamophobia and anti-Semitism. These far right groups, while at present a minority, should, however, not be underestimated. It is important to remain vigilant against them and their attempts at resurgence and expansion. BDS Italy calls on all people of conscience to denounce these despicable attempts to manipulate the Palestinian struggle and solidarity movements and to join the Palestinian-led campaign for BDS, committing to boycott Israel until it respects human rights and international law. Now more than ever Palestine needs genuine and effective solidarity. International March for Gaza Called August 9, 2014 Organizations can endorse at tinyurl.com/od94t8j or at facebook.com/events/744268822285936/. This entry was posted in All Posts News Politics and-or Videos, Dandelion Salad Videos, Gaza, Israel, Israel-Palestine-Gaza-Occupation, Palestine, Politics, Protests, Trade and tagged BDS, Chris Hedges, Israel-Gaza-Palestine War, Samer Badawi. Bookmark the permalink.